Scientists with the New Hampshire Agricultural Experiment Station have launched a research project that aims to develop the first varieties of strawberries specifically designed for organic agriculture in the United States. The organic strawberry varieties will be developed for optimal production in New England using advanced genetic techniques. UNH is one of a very small handful of institutions worldwide working at the forefront of strawberry genomics and its application to strawberry breeding. UNH began initial work on growing organic strawberries at the Woodman Horticultural Research Farm earlier this year. “We want to provide strawberry growers with regionally adapted, seed-propagated strawberry varieties that are suitable for organic agriculture and are pleasing to consumers. 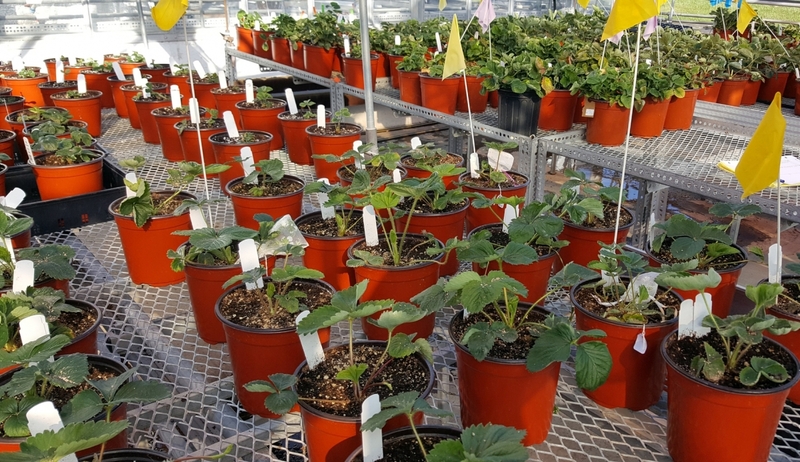 Organically certifiable, seed-propagated varieties provide an attractive and environmentally friendly alternative to the vegetatively propagated varieties currently relied upon by the strawberry industry,” Mahoney says. Mahoney and her collaborators, including Tom Davis, professor of genetics, molecular and evolutionary systems biology and sustainable agriculture and food systems, and Becky Sideman, professor of plant biology and Extension professor and specialist in sustainable horticulture production, will use an advanced breeding method called marker-assisted breeding, which allows scientists to conduct traditional cross-hybridization and trait-based selection using genetic testing. Mahoney and Davis will conduct the genetic testing using the IStraw90® SNP Array, which they helped develop. Organic strawberry seedlings at the Macfarlane Research Greenhouses. The research will be conducted at the UNH Macfarlane Research Greenhouses and Woodman Horticultural Research Farm. Preliminary research for this project was conducted at the two facilities earlier this year. The United States is the world’s leading producer of strawberries. In 2014, the country produced more than 3 billion pounds valued at $2.9 billion, according to the USDA. Most U.S. strawberries are grown in California, but strawberries are an important crop in New Hampshire, as well. Sideman estimates the retail value of New Hampshire’s strawberry crops at about $1.85 million. This research project is funded by the National Institute of Food and Agriculture’s Organic Agriculture Research and Extension Initiative (OREI) under accession number 1013061. 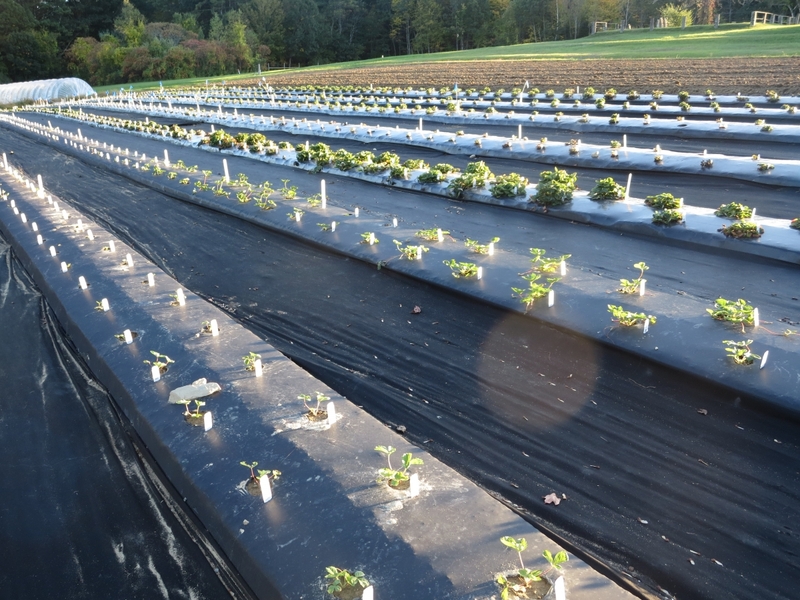 Collaborators also include Driscoll’s Berries, Inc., High Mowing Organic Seeds, and David Handley, vegetable and small fruit specialist at University of Maine Cooperative Extension, a recognized specialist and evaluator of strawberry varieties. This material is based upon work supported by the NH Agricultural Experiment Station, through joint funding of the National Institute of Food and Agriculture, U.S. Department of Agriculture, and the state of New Hampshire. This research also has been supported by a broad USDA/NIFA-funded international research effort, RosBREED.